If you want to sell more golf memberships you’ve got to narrowly define your audience, tell a great brand story, address their need or problem, and use the right tactics. I’ll break down each for you. The first step in selling anything, especially a luxury purchase like golf club membership, is to define your avatar. An avatar is the profile of the perfect person in the world. Think about their age, income level, profession, etc. But then go even deeper. What does their day look like? What problems do they run into? Write those down and keep them by your desk. If you can solve someone’s problems, you’ll hook them. So consider the question, “what challenges do these people face?” For example, are they new to the area, and looking for connections? Are they parents and want a safe enjoyable place for their kids? Are they busy and need a quick round under 4 hours? Figure out their challenges and show why your club is uniquely positioned to solve them. What amenities or activities do you have that can solve them. Present those on your social media, eBlasts and other advertising channels. No one wants to be sold a golf membership. No one wants to be “sold” anything for that matter. Unless you are in a commoditized industry, people buy things for emotional reasons. 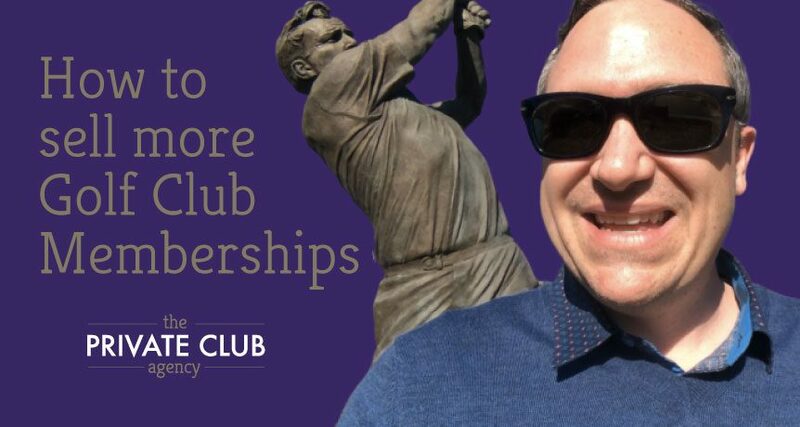 The best way I’ve found to sell golf memberships is to tap into the emotional side of the brain and focus on the club’s history, passion and tradition. The best way to do all that is to tell a compelling story. All good stories follow a similar narrative arc. I really love Donald Miller’s story structure. It goes like this: there’s a character, who has a problem, who meets a guide, who gives them a plan and calls them to action and that results in either a comedy or a tragedy. Of course, we’re in the comedy business 🙂 Your goal in telling the story of your club is to be the “guide” and to give your prospect “a plan”. Here’s a real world example. You can tell the story of Mr. Jones who had 3 small children at home and was new to the community. He had no friends and his business was struggling. But then he found XYZ Country Club. The club provided junior golf lessons, family friendly activities and even hosted a business networking group on Thursday mornings. Mr. Jones joined the club and made new life-long friends. His wife and 3 children had a safe environment to learn the game and enjoy the activities the club provided. It was the best decision he ever made. Remember, it’s even better to get someone else to tell your club’s story for you. So solicit reviews from members and make sure they get posted on places like Google Maps, Yelp, The Knot and other review sites. First off, never ever EVER discount your membership. This is a recipe for disaster. Clubs who slash initiation fees never recover. They enter a downward spiral that damages the long term viability of the club. Most clubs fund their capital improvements with initiation fees. If you have nothing in the fund, what will happen in 5 years when your mowers break down or the roof in the clubhouse starts leaking? All good brands get more exclusive and expensive over time. That should be the goal of your golf membership marketing. At the Private Club Agency, we’re having very good results with Facebook Ads. Facebook allows you to retarget folks who have visited your website. You can also use lookalike audiences to get very narrow in your targeting. Remember, instead of serving an “ad”, tell a story with these paid posts. Direct mail and the USPS’s Every Door Direct Mail Program is another effective and inexpensive way to find potential prospects for your club. In person networking: get out of the office and get into the community. Chamber of commerce or other local business associations are a great place to start. You could even host these meetings at your club and then give guests a tour afterwards. Video. Start creating some videos for your club. I’m not talking about boring drone videos. I’m talking about your pro teaching a lesson. Your chef showing a recipe. Your tennis pro serving up an ace. YouTube is a great place to share video. LinkedIn is also currently promoting native video heavily so you can upload there. Use live streaming on both Facebook and Youtube to make it even more interactive. Partner with local realtors. Give a closing gift to every new home purchase above $250,000 in your area. Something like a complimentary round of golf or lunch at the club would be a great way to build your prospect pipeline. Realtors will love giving their clients some free swag too. Get the youth golfing at your club. One of our clients invited the local high schools to come and have a club fitting. It of course, got all the parents of those golfers there too. Many clubs also allow the local high schools to use their course for practices and tournaments. This gets more eyeballs on your property. Start a referral program. Your members are your best source of new memberships. Find unique ways to reward them for inviting their friends to the club. Money isn’t a great motivator by the way. Try something unique, like a trip to a tournament or a behind the scenes tour. Those are just a few ways. Many more of course, but that should get your creative juices flowing. Pick a few out that you think you can accomplish in the next 90 days. Wish you lots of luck!!! !